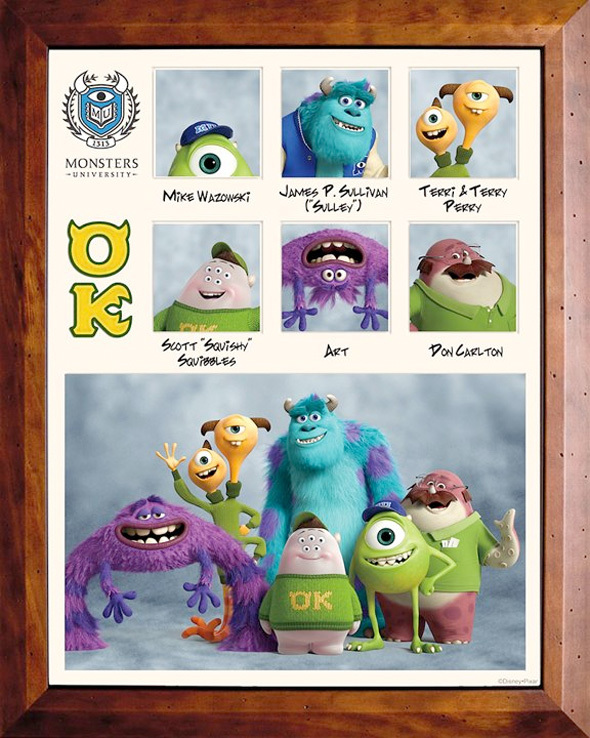 From the various trailers and TV spots, we've already gotten quite a taste of the college shenanigans that future friends Mike (Billy Crystal) and Sully (John Goodman) get into at Monsters University, the prequel to Pixar's original Monsters Inc. We've already met some of the new characters in the form of character posters, ID cards and class photos, and now we get to see even more with this set of photos highlighting the students of various fraternities and sororities with clever monstrous Greek names like Roar Omega Roar (RΩR) and Slugma Slugma Kappa (EEK). School this summer doesn't sound bad. Oozma Kappa (OK) - A collection of wholesome, good-natured misfits, the adorable brothers of Oozma Kappa (OK) have bonded over their inability to make it through the Scaring Program. With only four bodies in the house, they don’t even have enough members to compete in the Scare Games. What they lack in Scariness and self-confidence, they make up for in heart. Roar Omega Roar (RΩR) - The Roar Omega Roar (RΩR) fraternity is made up of the best of the best. 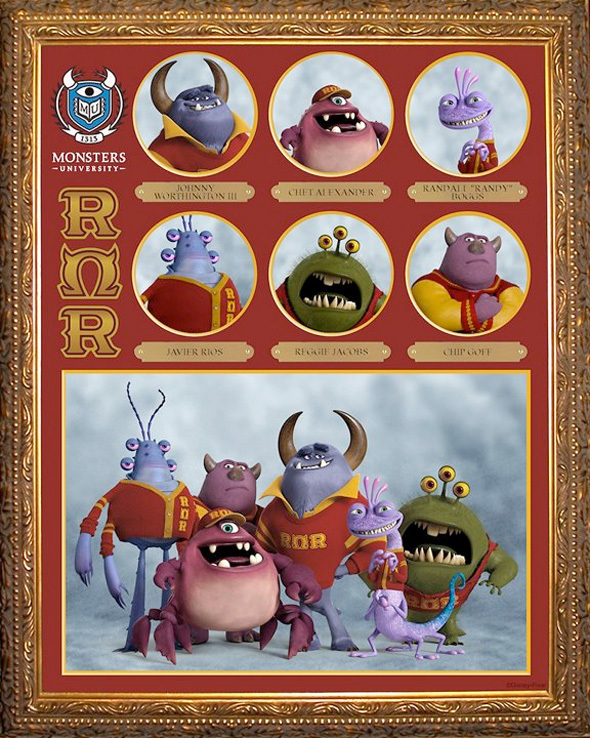 They’re the smartest, most skilled, Scariest monsters at Monsters University, and come from families with a long, proud history of Scaring. While the RΩRs may be preppy in dress, they are ferocious in action and downright ruthless, if necessary. Self-declared as the most elite house on campus, the RΩRs are lead by Johnny Worthington who presides over the house like an all-powerful monarch. Eager to continue their Scare Games winning streak, the RΩRs will do whatever it takes to stay on top. Slugma Slugma Kappa (EEK) - The athletic sisters of Slugma Slugma Kappa (EEK) spend most of their days working out and running drills to perfect their Scaring skills. Their initiation is a triathlon, and training together 24/7 has strengthened the bonds of sisterhood so much so that these strong, self-assured girls are ready to out-work and out-scare any monster they encounter together. 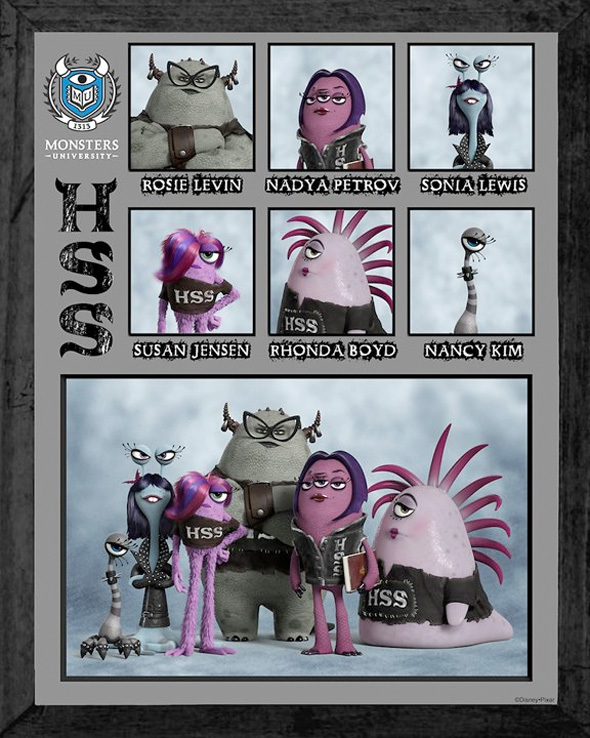 Eta Hiss Hiss (HSS) - The Eta Hiss Hiss (HSS) sorority has been around since the beginning of Monsters University and the members are as mysterious as they are terrifying. The HSS sisters might be pale, mysterious and sullen, but these intimidating Goth girls are fierce competitors and tough as nails. Fittingly, their most distinguished alumna is one of the most powerful, Scary monsters on campus who every new Scare student strives to impress—Dean Hardscrabble. Jaws Theta Chi (JOX) - Big on brawn but short on brainpower, the Jaws Theta Chi (JOX) fraternity brothers are rarely seen without their flashy letterman jackets. 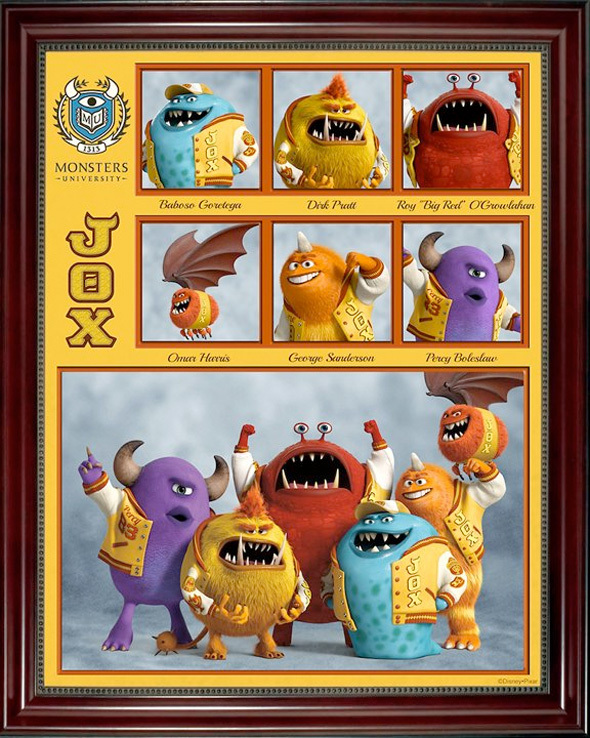 The JOX are brutal competitors who never hesitate to do whatever it takes to beat their opponent, even if it’s breaking the rules. Despite practically living at the gym or on the field, these sports-loving monsters often prove that bigger doesn’t always mean better when it comes to Scaring. 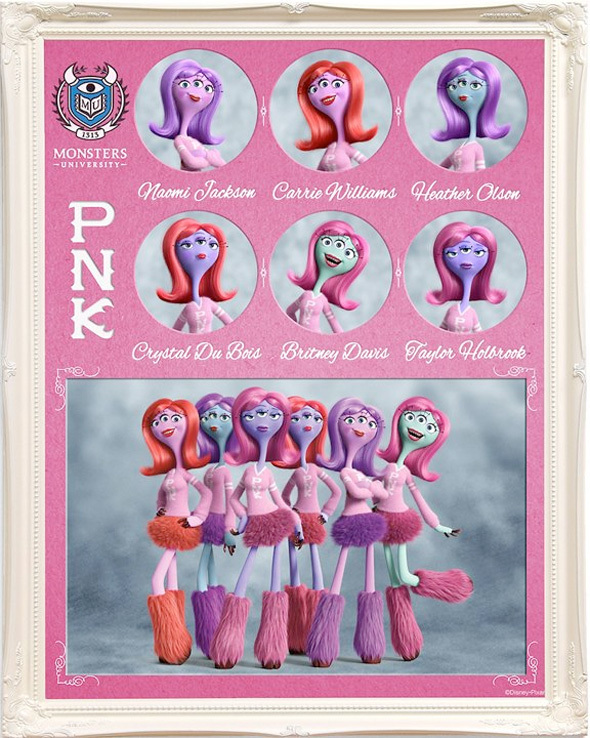 Python Nu Kappa (PNK) - Pretty in pink, the sisters of Python Nu Kappa (PNK) are not to be underestimated. Led by their fearless queen bee Carrie, these ladies are smart, cold-hearted and merciless. Covered in pink from head to toe, the PNKs sweet exterior quickly turns terrifying when the Scare Games begin. 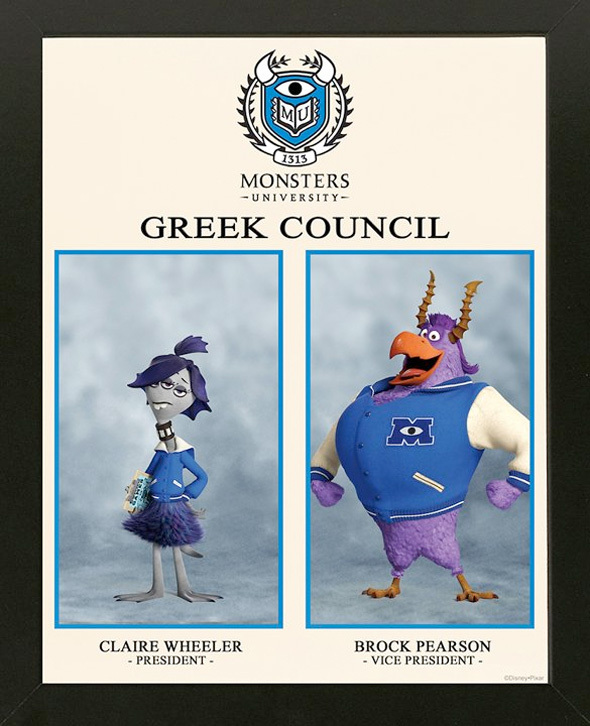 Claire Wheeler, Greek Council President (Aubrey Plaza) - Claire Wheeler is the Greek Council president at Monsters University, and this year she is one of the chosen emcees for the school’s annual Scare Games. Don’t be fooled by Claire’s brooding exterior and monotone drawl—banal in appearance, on the inside she is a galvanizing force of school spirit who diligently warns the Scare Game participants of the dangers they will face. This preppy-looking fraternity monster has been chosen to assist the Greek Council president in emceeing the school’s annual Scare Games. Jock-like and what some might refer to as a “meathead,” Brock is a loud, enthusiastic emcee who relishes the danger of the Scare Games’ challenges.